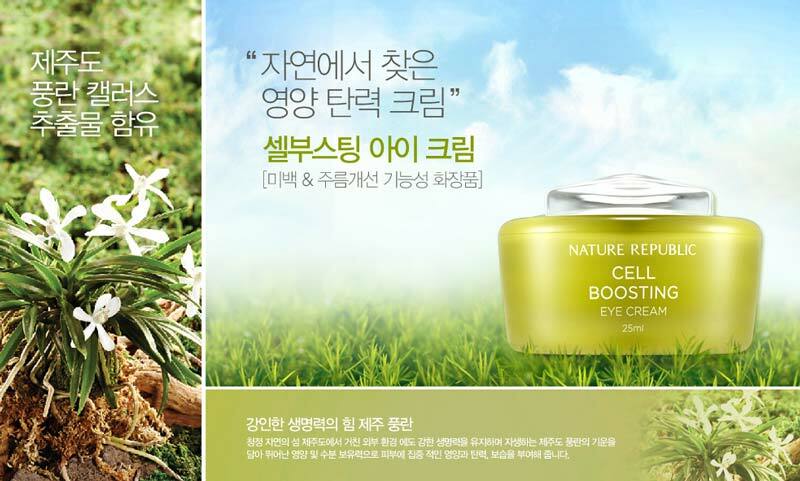 Radiant your Skin Care with the [Nature Republic] Cell Boosting Eye Cream! we aim to provide you best korean products to take good care of your skin, including Cosmetics, Skincare, Eye Cream. Hydra Eye Cream online. Nature Republic's Advanced Cell Boosting EX is a premium elasticity-strengthening product line that revitalizes the skin and makes it appear transparent by providing vitality to the skin. This concentrated eye cream with thick and nutritious texture provides moisture and resilience around the dry and vulnerable eye areas, and maintains firm. It is a premium elasticity eye cream that will take care to clear skin with full of abundance and blowing-in the vitality glowing skin texture . It contains fermented medical mushroom extracts and furan callus culture extract which leads to vigor and animation skin. After using cream, gently spread around eye rim, and pat with fingertips. I found this cream texture a bit heavy for me and it doesn't work and absorb as good as NR Collagen Dream one.